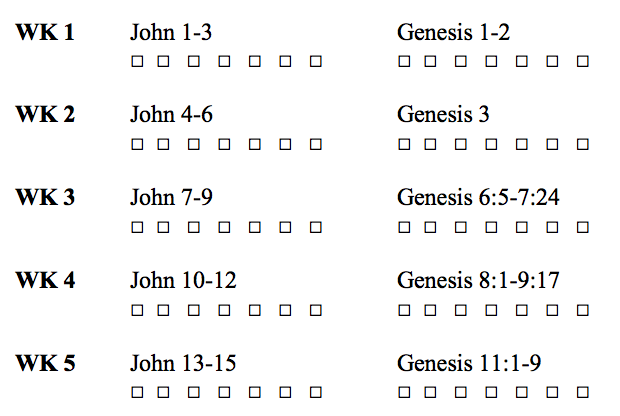 A New Bible Reading Plan! For the past six years (or so, give or take), several of my friends, and their friends, and their friends’ friends, have been reading the Bible every day together. We read (or listen to) about 7 chapters of the New Testament together every day and text out that we did our reading to the large group via a Google Hangout we setup. Now, because we read the same chapters for 30 days, we’ve read the NT some 60 times in the span of about 6 years. And it’s been great! But it is also time for something new. FEEDBACK: One piece of feedback I got over the past few years was how cool it would be if we integrated some Old Testament reading. So some in our group started reading through the OT each day (about three chap per day) in addition to the NT reading. But it was a LOT of reading to do every day, and if you missed a day or two, you found yourself having to read 9 chapters of Leviticus and another 7 of the NT to catch up! We also heard that while the NT repetition was helpful, reading 6-7 chapters for 30 days got a little stale, and my own personal issue with this was that it didn’t allow a more devotional posture of reading, where one could spend a few minutes really thinking over a smaller section of Scripture. So…with the help of my good friend, Pastor Dennis Lankford, and the feedback of friends Derek and Parris, we’ve created a new reading plan. If you want to take part in the reading, you’ll need to join Google hangouts (it’s best to just download the App). Next, message me and I will invite you to the Hangout. Finally, start reading and letting everyone else know how its going!